loomixguy wrote: Never said or thought anybody was dumb.........Just posted what dealer cost would be on a 20% AN range cube, before adding margin, freight, or applying any discounts. Sorry if you thought I insulted you. What kind of problem's with distiller's? I've heard how the cow's won't breedback,you'll get brainer's etc.etc.etc. I fed my cows 30#s of wet per head per day last winter was cheaper than hay the cows were fat and not one brainer.Now it's a year later and the cows are calveing faster than any year in the past.To me it's a feed company seeing a loss of money if they don't convince the farmer/rancher to buy their miracal in a bag or tank.If you want an honest answer ask someone who's done it.I've over fed wet distillars 3 times more than they reccommend with no ill effects.You can load a trailer full of it and park it right out with the cows they will eat until they are full and walk away.This was all done with wet distillars grain so the dry would be different.Plus the hay intake was cut in 1/2.Our local feed mill put on meeting/meal talking about feeding distiller's they had those old farmer's scared to death of the product.It worked on many of them as they keep selling lick barrel's.Feed salesman are like the government they only worry about their own bottom line.I've seen a good friend go broke on advice from his feedman.He was a dairy farmer. The producer we know that fed distillers to his cows fed them right on the ground one scoop shovel at a time. His cows were in good shape and no ill effects that I ever heard of. These were dry ones. Wet ones have water added? I've never been around them. I've heard of it. The guy who bought our steer calves was pleased to see we had been feeding them dry distillers he thought they would then go to eating wet ones easily. It's not PMS it's you. Whatever other people think of you is none of your business. Denny, I don't see how it is even possible to raise a corn silage crop worth anything without a heavy shot of fertilizer, especially nitrogen, you would especially have to add back P & K if you you're going to do it for more than one year, as silage and even hay removes a tremendous amount of fertilizer. You may not see it for a few years, but a lot of people's yields taper off slowly enough that they don't even realize how much they are losing in yield after five years. Just my opinion, maybe I've been suckered by the fertilizer companies, I know I'm funding them well. Denny wrote: In our area most guys who fertilize feed nothing but hay of course they lay on as much as they eat also..Myself I have fed wet distillars grain's the last 2 winter's but now since everyone has caught on the price went from Free to $34 per ton plus trucking.It may still sound cheap to some but it's 2/3rds moisture and labor intensive to feed to me it's not worth it.I will go back to planting corn for silage and feed hay.I don't use any fertilizer other than a little cow manure.When I first began running cows the ate a steady diet of swamp hay clear till grass.They were a little rough but bred back well and weaning weight's averaged 550#s.I know I made more money then.This winter I've really skimped my cows thru hay at $60 to $100 a bale for 8% protein is'nt worth it in my book. From what I've seen on Alfalfa the little bit I've fed once they had some they would'nt eat my poor quality hay which I have lot's of. The wet distillar's is the same as dry before it's dried.Alot of bulk so the tend to fill up on it. As far as growing corn the best corn I've ever raised was on new breaking we just plowed down a hayfield and planted corn.No starter or top dress just what mother nature provide's.Our corn ground was in field peas last year and we calve on it each spring they are there for 3 months 260 cows on 80 acres.It gets a fresh coat of manure every year.The peas were suppose to add 50#s of nitrogen per acre so we will see. movin' on wrote: Feeding alfalfa to a large number of cows is not a problem. Yes, you have to have a bale-bed to get the job done, but they will usually outlast several pickups. Alfalfa is the best hay in for unrolling, too. A good alfalfa bale that was baled right can take 1/4 to nearly 1/2 a mile to unroll. That's quite a bit of area for the cows to line up on both sides of and eat. For those of you that have a tractor close to where the cows winter, there is a wonderful bale-unroller contraption they make for the three point. They are way less expensive than a conventional bale-bed for a pickup. If anyone is interested, I'll post a link on here. Movin On, is this a 3 pt bale unroller similar to the one you were talking about. It called a spinoff. It has a long bale spear with 3 fingers that spin on the shaft. It's been a handy piece of equipment for us. Nice for unrolling in tight spots and along the creek where space is limited. Main thing is spear the center of the bale and it will unroll without any wobbling. Here's a few pics of the Spin Off model. I guess the equivalent of 'cake' up here is grain screening pellets-in the drought years we wintered on flax or wheat straw and pellets. It was a great exercise program the kids and I fed about 100 five gallon pales a day. I had two tractor tires bolted together with a hole in the top-we'd pail it full then pick up with the bale deck-it would drop a pile every revolution.One thing about pellets when it gets bitterly cold you can adjust the ration fairly quickly upward-this winter when it got -50 for several days all the hay they could eat wasn't quite enough. No, Empty Pockets, that's actually different from the one I was talking about. I've never seen one quite like yours. It looks like it gets the job done just fine. I'll see if I can find a link to the one I've used in the past. Ok, here it is. It's the one on the bottom of the list. There no hydraulic ram in it as pictured. The ram obviously goes from one of the pieces of black flat iron to the other. Works really good. It just about doesn't grip a 4 ft. bale is the only problem I have with it. I have one of those Movin, good tool. solved this by seeding alfalfa with my grass and feeding mixed alfalfa/brome bales.I still give the older girls some barley chop. interestingly there is an article in the new addition of Agriview about wet/dry distillers grain becoming more available in Sk. The Good Lord sure will back me,that I ain't a rodeo man,tho I sat my share of buckin stock when it wasn't in my plan...-CM-. I knew if I looked hard enough I could find this. The original question about "why cake?" I like feeding alfalfa, remember the protein pool lasts roughly 48 hours, so every other day is fine, (preferable so the boss cows don't get all the feed). Twice a week is mostly ok if weather is decent, and primary feed is decent, and you have dry cows. Really, every other day is a better option. Lining up your cows 3 times a week and the inspection opportunity is worth what it costs to unroll some alfalfa. As noted, all alfalfa isn't equal. FH sez test & that's a good idea. Unroll on turfy grass and hay loss will be negligible. 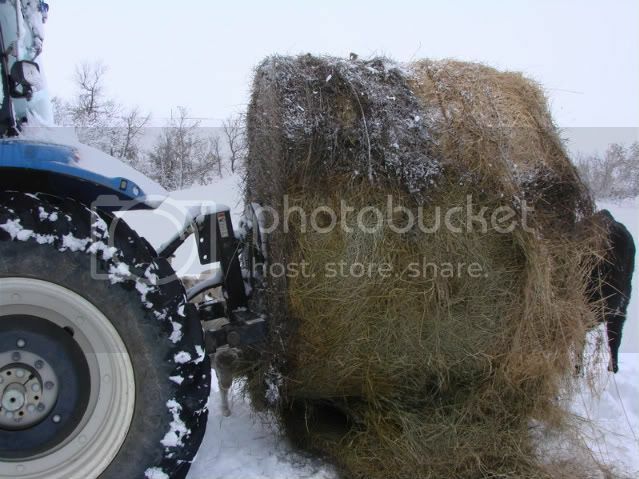 You can unroll 1 of 2 ways - with the way you rolled the bale orthe opposite way you baled. I like with, but with unrolls faster so you don't spread out the hay as much. I feed at least 10# at a time so spreading out hay isn't an issue. They'll clean up better if you don't stretch out so far, and I feel like feeding the opposite way you baled beats the leaves off worse. Caking with alfalfa is another example of where you might want to take control of the process - night baled alfalfa works sooo much better. I see people baling alfalfa in the afternoon and their baler is blowing dust like a combine, any leaves that do make it into the bale instead of blowing to sd, will be so powdery they won't get used well, (but that hay will still test well). The way to tell if you are unrolling in the same direction hay was baled: rub your hand on the top half of the flat end of a bale. When you rub one direction, your hand rubes smooth & one direction your hand gets poked by the stem ends. So if you moved your hand from east to west and it was smooth, then unroll from the east in a west direction. So if you want to spread out your hay more, unroll the other direction. If you cut with an 18' platform, then double the windrows with a rake, you probably want to unroll against the way it was baled because the other way will unroll very fast and thick. I think hendersons south of meriman might have some alfalfa for sale. They put up some legit nice hay but about everyone got snakebit on 3rd cutting. Rain and turn, rain and turn, pretty soon you're baling it to get it off the field.